Dipped and Molded Candle Making tutorials. The candle making business demand is still very much valuable in several places around the globe. Candle making is an ancient technique with significant uses, which still makes it a promising business venture. 1. Prepare the waxes. For every Kg of paraffin wax, add 100 grams of polyethylene wax and 30 to 50 grams of crystal wax. If the paraffin wax is in a slab form, break it first into small pieces. 2. Heat the wax in a container other than the dipping tube. The safest way is to use a double boiler. If without a double boiler, heat the wax slowly in a pouring pot or saucepan. 3. Wax is completely melted if the liquid is clear and the bottom of the container is seen. DO NOT BURN WAX (indicated by smoky fumes and brown coloration). 4. Remove from heat source and transfer contents into another container either in dipping tube or metal cup with spout. Add dye and scent (optional). The wax is now ready for dipping and/or molding. 1. Cut wick(s) into several inches longer than the desired candle length. 2. If you wish to dip several candles at the same time, tie the wicks 2 to 3 inches apart on a rod or a hoop. 3. Dip the wick into the melted wax. Withdraw the wick and pull on the other end to make it taut. Dip the wick again after the first layer of wax hardens. 4. Continue dipping the candles until it reaches the desired thickness. Allow each layer of wax to cool and harden after every dipping. 5. To make the bottoms of the dipped candles flat and smooth, heat a metal spatula over a gas flame or electric burner. Rub the candle bottoms against hot metal surface, melting away until the bottoms are flat. B. MOLDED CANDLES (Molders can be purchased, made or found). 1. Prepare mold to release candle by applying the inside of the molder with a thin layer of separator. 2. Prepare the wick. The size of the wick depends on the size of the candle. The wick is usually placed in the mold before the wax is poured. However, certain candles require that the wick be inserted after the candle is made. This is done by piercing a wick hole in the candle with a hot ice pick. 3. Hold mold in a slanting position. Pour hot wax from pot to metal cup with spout, then, from cup slowly into the mold. 4. Cool mold by placing it in a pail with cold water. Hold down with a heavy object. 5. After cooling, notice that portion about the wick recedes. Puncture and pour wax into the cavity until filled. 6. Cool the mold again. After the wax has set, remove mold from water. Pull wick gently to release the candle. Trim excess wick. 1. Always have a fire extinguisher within reach. 2. Never use water to extinguish a wax fire. Liquid wax behaves much the same way as oil, and therefore needs to be treated like an oil fire. 3. NEVER LEAVE MELTING WAX UNATTENDED. 4. Constantly monitor the temperature of the wax. If wax reaches the flash point, then the vapors produced are extremely flammable. 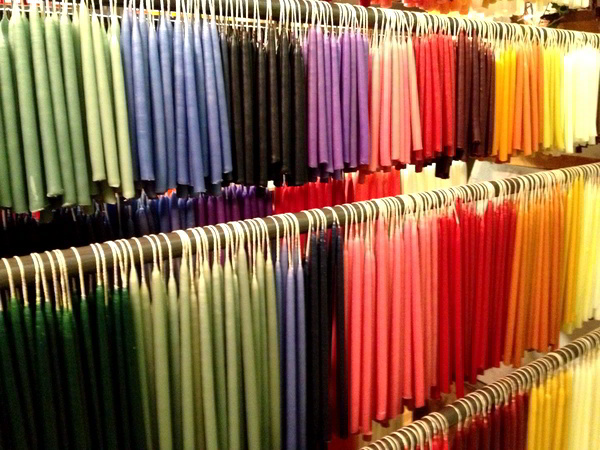 The flash point of wax is typically above 300° F. Never let wax exceed 250° F.
5. Always use a double boiler. A double boiler helps distribute heat and prevents dangerous temperatures. Never melt wax directly on your stove. 6. Use an electric heat source if possible. If, by accident, the wax reaches the flash point, vapors may find a flame and become ignited on an electric heat source. Any open flame such as that found on a gas stove, will ignite wax vapors. 7. Always use a thermometer to monitor the wax temperatures. Put it on your list of things to get before you start making candles. where can you buy supplies for candle making? Hi, where do you buy waxes in manila? thanks. I’m from cebu, I am interested in candle making business, can you recommend me where can I get materials here?, many thanks.